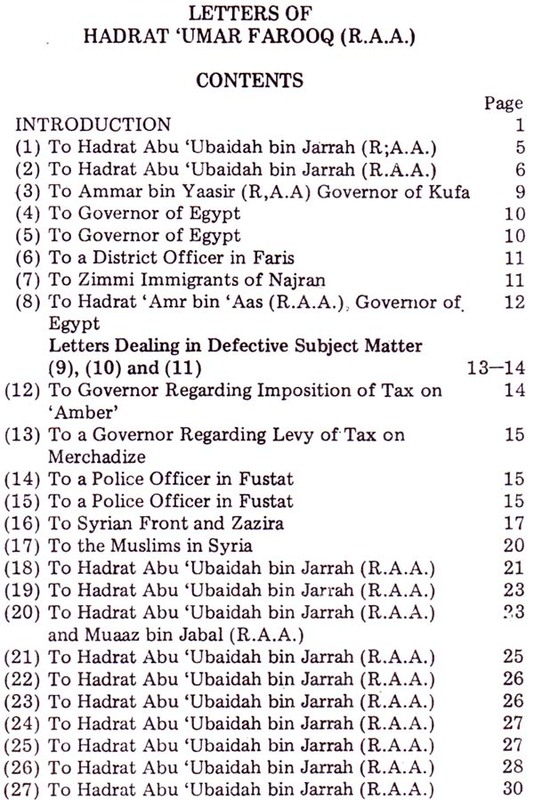 The letters addressed to different officials of the Islamic State by Hadrat ‘Umar Farooq (R.A.A.) reflect the working of managing the affairs of different groupings based on ethnic linguistic tendences through the linking forces of Islam. This policy is in continuation of the strategy applied by his predecessors Hadrat Abu Bakr Siddiq (R.A.A.) and the Holy Prophet and Messenger of Allah (S.A.W). As can be seen through the pages of history, in a few years after Hijrat, the Prophet of Allah (S.A.W.) 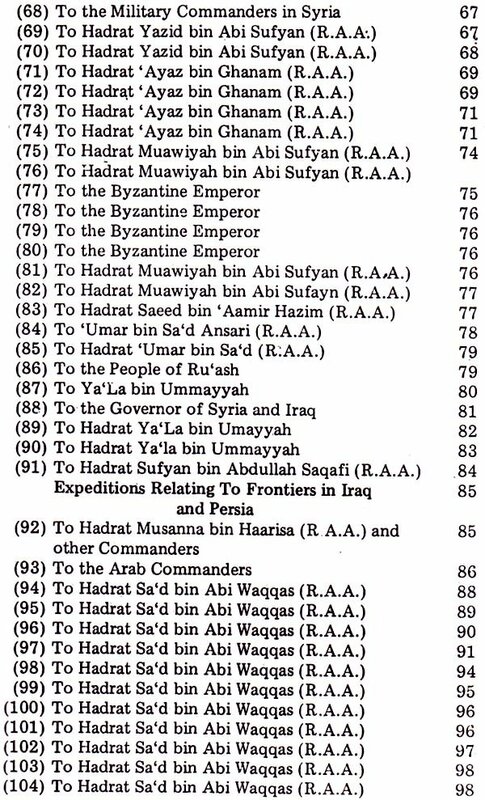 carried the message of Islam in the far off distant corners of Arabian Peninsula and thus laid the foundations of Islamic State as enunciated in the Quran. The establishment of the infant State at Madina was a living practical demonstration of the Quranic theory of life and its administration. At the time of passing of the Prophet of Allah. Muhammad (S.A.W.) from this mundane world, the process of intellectual awakening was at the initial stage. The Meesaq-i-Madina or the Charter of Madina represents the ideal working of managing the affairs of different peoples of different caste, colour, creed and language. But the demise of the Prophet of Allah (S.A.W.) seemed to be the bursting of the lava from a volcano. A considerable populace of Arabia became hostile to the newly established way of life Deen-e-Islam, as it had not gone deep into the very core of their hearts. The old habits forming part of their second nature, were being revived. On the 12th Rabi-ul-Awwal, 11 Ali Abu Bakr (R.A.A.) was elected the Caliph or lieutenant of the Messenger of Allah (S.A.W.) certainly against his wishes. The situation was extremely critical. There was potent danger to the newly established ideological infant State of Madina. Almighty Allah helped the Muslims and the personality of Hadrat Abu Bakr (R.A.A.) was brought in the lime light. It was characteristic of him to show greater resoluteness and determination according to the danger and impending perils. Soon after becoming the Caliph or the true lieutenant of the Messenger of Allah (S.A.W. ), Abu Bakr (R.A.A.) delivered the monumental Khutba (inaugural address) to the public as well as to the elite, declaring that he has been elected as their Ameer (chief) and Wali (Administrator) but in no way he is superior to them. He requested the audience to help him as long as he acted in the right direction, but may be put to right if he deviated from the right path. It was in this spirit that he managed to dispel the forces of evil by an iron hand, duly applied through his pen and sword. The letters written by. the first Caliph of Islam to bring round the unruly and the turbulent element are pithy, brief, short and to the point. They are written in a very simple, factual, realistic and forceful style, avoiding bombasticism, rhetoric and superfluity. They are impressive, fact-finding, affectionate criticism of life to help maintain and establish the system of life-Deen-e-Islam. Hadrat ‘Umar Farooq (R.A.A.) remained the pivot of the central authority in Islam or Khalifa for about ten years from 13 A.H. to 23 A.H. During the period under reference he did not leave any thing to carry out the Commandments of the Prophet of Allah (S.A.W.) on the foot-prints left by his successor, Hadrat Abu Bakr Siddiq (R.A.A.). His tenure of service in the cause of Islam as the Khalifa in Islam was extremely engaging and busy in every moment. 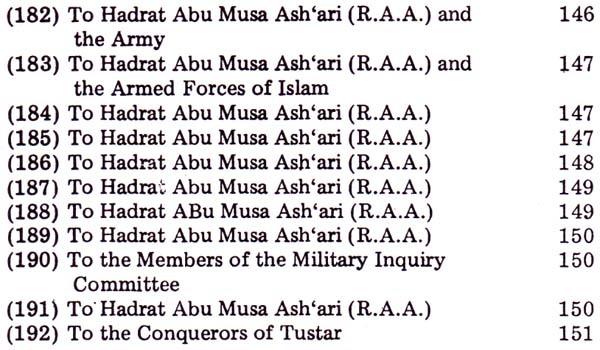 Not a single day passed without any engagement on the front by different commanders, provincial governors, Zakat collectors and emissaries from different parts of the Islamic State as it was the legitimate centre in Islam controlling every situation arising out from the continuous struggle to help establish and consolidate Muslim Ummah from all practical fronts of life. There was a constant flow of in-coming and out-going emissaries seeking instructions, orders and commandments regarding. impending victories, diplomatic maneuvering, establishment of law and order situation, different convenants, supply of arms and ammunition, disposal of booty, Jiziyah and Zakat matters including other civil and military affairs. All these state matters, more or less needed urgent, instantaneous attention of the Khalifa in Islam. In contradiction to the above cited position, there was no regular office of the Khalifa and there was a skeleton staff to look after. His mode was to write a few words on the back of the letters and applications received from concerned officials and elaborated them before those who brought them, clearly, inculcating the exact meaning and purport of the message from the central’ authority. In the absence of any written message from the official concerned, the instructions or orders were communicated to them on a small piece of paper or on a leather piece. The paper was pretty costly and rare during these days. During emergency and rush of work the Khalifa, ‘Umar Farooq (R.A.A.) directed his secretary to write the gist of his instructions that may be conveyed to the person concerned. Thus Hadi at ‘Umar Farooq (R.A.A.) disposed of so many references, queries and questions under the system mentioned above. 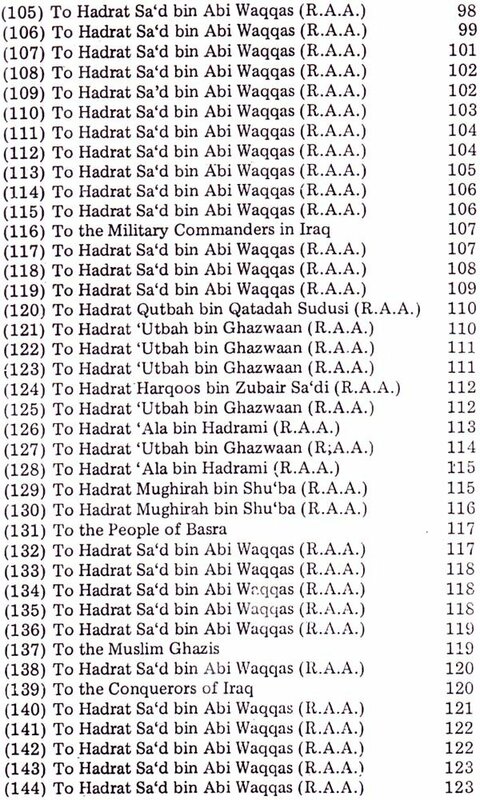 The mode of other Khalifas regarding disposal of inquiries from far off distant places of the Islamic State was more or less the same. Whenever a commander, officer, governor, collector of Zakat or any other person received some written instructions on the back of the paper sent from the Khalifa in Islam, the .same was read out to the people concerned and relevant instructions were also given by the emissaries who brought the paper; The commander-in-chief used to read out the same in front of his army, the governor before his advisers, the Zakat collector before the devotees of the Salat alongwith the verbal guidance Ion the point by the concerned plenipotentiary. Thereafter the importance of the paper lost its significance and used to be destroyed. But the same could not be wiped out from the memory of the masses and the same continued to be discussed among the forthcoming generations. Thus the importance and invulnerable value of the scribe regarding his selfless attitude, God-fearing aptitude, spirit of Jihad, legal acumen, political sagacity, welfare of the Muslims and such other sentiments should be symbolized and nurtured with the person of the scribe. Thus we find there are different versions of a particular writing attributed to the Second Khalifa of Islam, Hadrat ‘Umar Farooq (R.A.A.) on the authority of those reporting the same. There are many letters that are at variance in ‘subject matter, variety of volume and different shades of meanings. This may be due to the reporting of the persons and the subsequent narration of the aasaar reports by the persons coming after them. 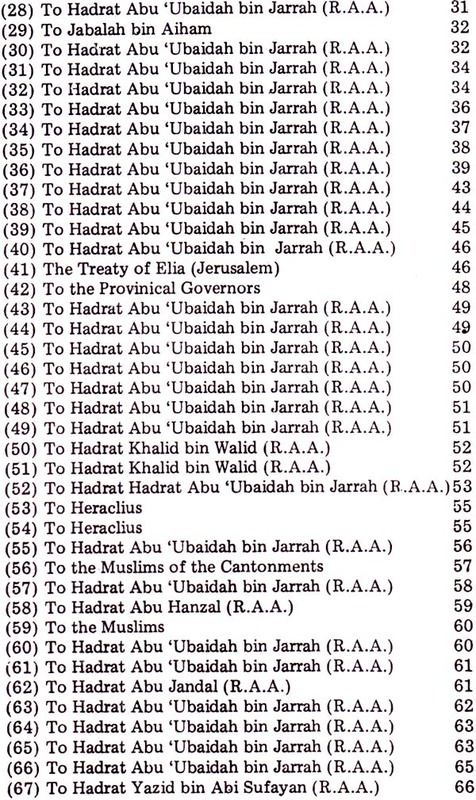 The writings of the Second Khalifa of Islam, Hadrat ‘Umar Farooq (R.A.A.) indicate his tight, rough and tough nature as a strict disciplinarian and acute diplomat, imbibed with the spirit of truth, enforcing Shariah who would not even spare his son from the enforcement of hudood (divine punishment in moral turpitude). In the end, it may safely be stated that the aim and purpose of the writings attributed to the Holy Prophet Muhammad (S.A.W.) in the form of Meesaaq-i-Madilla, the letters and despatches sent by the first lieutenant of the Messenger of Allah (S.A.W.) 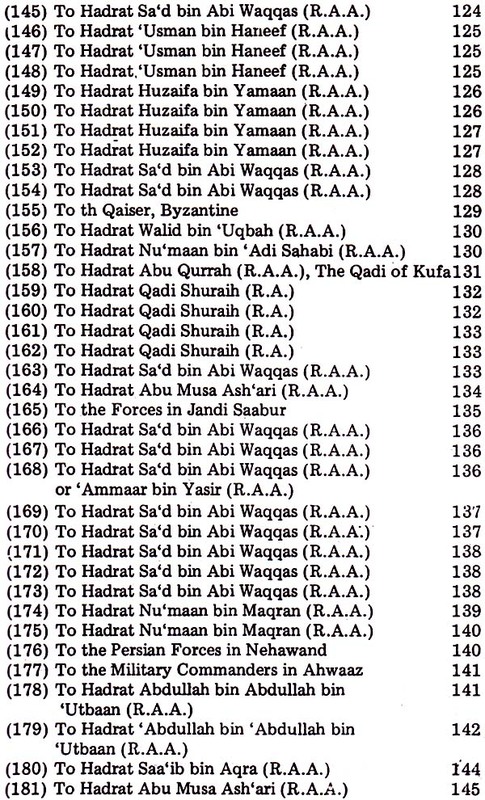 and the collection of instructions, guidance, readers on different petitions or despatches sent to the Second Khalifa of Islam, Hadrat ‘Umar Farooq (R.A.A.) represent unanimously the one central theme the art of managing the affairs of different ethnic groupings, based on linguistic varieties, races, castes, colours and creeds. This process continued in one form or the other whether in crude form or uniform through the Khalifa in Islam the central authority to supervise the affairs of Muslim Ummah according to the Qur.aan and the practice and precept of the Sunnah of the Holy Prophet Muhammad (S.A.W.) which was abolished on 4th March 1924. Its revival is of far vital importance for the consolidation of Muslim Ummah and its regeneration among the polity of the different nations of the world. Let us arise and act!